You’ve crafted your business plan and secured the necessary equipment to get your small business off the ground. But your company can’t start soaring until you figure out how to handle transactions with your customers. Luckily, today’s point-of-sale (POS) systems are much more than the iPad equivalent of a cash register. Whether you’re opening a café, retail shop, or gourmet food truck, there is a POS system that will fit the needs of your start-up. A point-of-sale system allows customers to pay for goods and services. It’s used to process sales transactions, record and track inventory, manage employees, and keep your business in fighting shape. A POS system can help you streamline processes and collect data that provides valuable insight so you can make informed business decisions. Getting a complete POS system typically includes a combination of hardware components, software applications, installation, and employee training. Since you stand to gain so much from a POS system, it’s important to understand which system and features will work best for you. 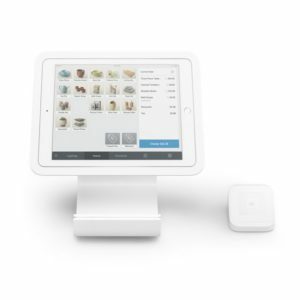 The basic, must-have hardware components of a point-of-sale system are a server, a computer terminal and keyboard at the checkout location, a cash drawer, a credit and debit card swiper, a pin pad, and a printer for customer receipts. Depending on your business needs, other devices may include a barcode scanner for quick, automated data input; a customer-facing display; and a scale for weighing products. With the advancement in mobile and wireless technology, you may also want to invest in more efficient devices, such as touchscreen monitors, tablets, and smart phones. What is an electronic point-of-sale (EPOS) system? Similar to a traditional POS arrangement, an electronic point-of-sale (EPOS) system is used by small-business owners to accept payments from customers. An EPOS system is a combination of hardware and software that processes sales transactions and manages inventory in real time. Hardware includes a central computer terminal and peripheral devices, such as barcode scanners, receipt printers, and chip and pin devices, that connect to it wirelessly or via cables. And with the right POS system, you can customize the software to your industry and business needs. The downside of an EPOS system is the cost, and the software requires regular maintenance and updates. If you aren’t prepared to invest in a full-featured system right away, renting an EPOS system or taking on a flexible payment plan may be a better option. A cloud-based POS system is a web-based, software-as-a-service (SaaS) solution that stores your data in the cloud instead of on a computer. Unlike a traditional server-based POS system, you can access data, process payments, and get automatic updates via the internet. Your data is accessible anywhere, anytime via the internet. Automatic upgrades and data backups help your business avoid costly downtime. As mentioned above, cloud-based POS systems enable you to take your business anywhere. Plus, you can continue to take payments from your customers even if your internet connection is interrupted—your system will track sales and sync your data as soon as you’re back online. That makes a cloud-based platform ideal for small-business owners who travel to trade shows, art and craft fairs, and farmers and produce markets to sell products. If you aren’t comfortable with migrating to the cloud, a traditional on-premises software solution may be a better choice for your new business. With this method, you can purchase software licenses and install the apps yourself on your computer system. On the flip side, you are also responsible for maintaining the software and installing upgrades. Whatever software solution you choose for your start-up, make sure it’s customizable to fit your needs. You can start with basic POS features, such as recording sales transactions and inventory tracking, and as your business grows, you can add capabilities like employee management and custom analytics and reporting. Customer relationship management (CRM) is a point-of-sale system feature that enables you to track patrons’ buying behavior, create customer profiles, and identify your most valuable customers. With this software, you can create loyalty and reward programs, personalize communication with your customers, and use other marketing tools to make a lasting impression on the folks buying your product or service. As a business owner, you’re already working to develop long-term relationships with your customers. But did you know that for nearly two-thirds of small-business owners, over half of their annual revenue comes from repeat customers?1 CRM can help you engage with your customers and keep them coming back. Inventory management is an automated tool that enables small-business owners to gather data in real time, track best-selling items, and replenish stock quickly. Through barcode identification technology, you can receive, track, and sell items in real time. That means you can avoid the headache of recording sales and monitoring inventory levels on your own. Maximize your face-to-face time with your customers by knowing what products you have on hand. You want to bring your A game when you’re talking with customers, so quick and detailed information about your inventory is vital. Imagine if a customer asks about the availability of a specific item, and within seconds, you have an answer—without sifting through mounds of inventory in your back room. Improved customer service is just one of the benefits of a POS system with inventory management capabilities. Maximize your face-to-face time with your customers by knowing what products you have on hand. It doesn’t hurt to have quick access to quantity and pricing data either. To keep your businesses running even more smoothly, POS systems with inventory management enable you to review and download detailed reports, receive low-stock alerts, and evaluate profit margins. With data reporting, you can make important decisions, such as how and when to adjust product pricing. You can also spend less time worrying about running out of popular items and more time creating quality experiences for your customers. How do I choose a POS system based on my industry? As convenient as it would be to have one POS system to rule them all, one-size-fits-all POS systems don’t exist. Day-to-day operations and processes vary depending on the type of business. Whether you’re a retailer, restaurant owner, contractor, or food truck operator, some functions and features are must-haves, while others may not be quite as important. Those running a retail venture need POS system capabilities that offer customer convenience while streamlining the sales transaction process. A mobile point-of-sale (mPOS) system is a practical solution. According to a retail POS market analysis, the expected compound annual growth rate of mPOS terminals is over 17% from 2016 to 2024.2 One contributing factor is that small-business owners are embracing the convenience of user-friendly tablets—a powerful substitute for traditional POS systems. With wireless technology evolving, the use of iPads, iPhones, smart phones, and other smaller devices are gaining traction. Like a traditional POS system, an mPOS system also functions as a cash register, using handheld devices to process transactions rather than the usual hardware. With mPOS capabilities, you can ditch the register and engage with customers as they shop throughout the store. Your staff can interact with customers and take payments with their wireless devices instead of being stuck behind a checkout counter—meaning your customers will spend less time in aggravating lines and more time enjoying your business’s stellar services. Before you commit to purchasing any POS system for your retail business, you may want to search for vendors that offer a free 30-day trial period and research what the best POS systems are for your business. Whether you own a bar, café, or restaurant, look for tools to stay organized, simplify operations, improve staff interaction with customers, and provide top-notch dining experiences. Some mPOS apps enable waitstaff to take orders table side and send them directly to the kitchen—an efficient, time-saving feature your patrons will appreciate. When it’s time to pay the bill, customers can do that from their tables without waiting for their server, which can also prevent overcrowding at a single check-out location. To eliminate the hassle of manually totaling each customer’s amount, look for automatic gratuity calculations and bill-splitting features. As a restaurant owner, you know that running out of ingredients to make your most popular menu items would be a disaster. With inventory management software, you can track ingredients and keep your kitchen stocked with the essentials. Some restaurant-specific software is ingredient-based, which means you can break down recipe costs to the raw ingredients. By tracking the basics, you’ll have a better understanding of exactly how much you’re paying for each plate that leaves your kitchen. With this info, you can calculate your profitability and overall ROI. Your business may also benefit from staff management and scheduling, menu management, and customized reporting. If your restaurant is open after normal business hours, you may want to invest in a POS system that offers 24/7 technical support and live chat. When you’re operating a contracting business, you have a lot to keep track of: customers, employees, suppliers, inventory, and more. Before you start scheduling jobs, you need to find a POS system that will keep you organized and keep up with the daily demands of your business. As a contractor, you’re likely to spend most of your time on the go, so an mPOS system is a good option for accepting payments no matter where you are. Bidding a job is also a critical part of your work, so you may want to check out POS systems with construction estimating software to help you calculate labor costs and price materials. This feature can take the guesswork out of estimating jobs and come up with accurate proposals for your customers. With so many moving parts to your daily operations, accounting software integrated with your POS system can streamline bookkeeping and accounting processes. You can free up time with automatic accounts payable and accounts receivable updates while ensuring accuracy and reducing the risk of error that comes with manual data entries. Organizing your business expenses and tracking important financial data is key to making your business more efficient, and when tax season arrives, you can easily access data and produce detailed reports for your accountant. When you’ve got a food truck, you’re always on the go, so an mPOS system is a necessity. With an mPOS system, you can process transactions using iOS and Android devices, giving you the flexibility to take orders from your window or, if a long line is forming, send an employee with an iPad to take orders and interact with hungry customers. A mobile system also allows you to operate without a Wi-Fi connection. So if your truck is parked in the middle of nowhere with no internet access, you don’t have to worry—you can still take orders and process payments. As you get ready to take your culinary skills on the road, carefully think about what other features you’ll need. When you’re on the move, keeping in touch with customers via social media is important. A POS system with built-in Twitter integration allows you to communicate and monitor your Twitter feed quickly. You can also attract customers on Facebook and let them know your location, hours of operation, daily specials, and more. Many mPOS systems come with a mobile credit card reader, which is a small device that easily attaches to a tablet or smartphone. Square is one affordable, user-friendly option for accepting payments on the go. By signing up, you get not only a free card reader and access to the mPOS app but also a flat fee of 2.75% with no additional transaction or monthly fees. Take a look at why Square is a popular choice in the food truck industry. POS systems vs. credit card terminals—which solution is right for you? Point-of-sale systems can tackle a range of tasks. They allow small businesses to accept credit and debit cards, print customer receipts, track inventory, and more. A POS system could include several hardware components, such as computer terminals, keyboards, and touchscreen monitors, or it can be designed for on-the-go use. A credit card terminal is a small, lightweight machine with a screen, keypad, magstripe card reader, and signature pen. Yet unlike the versatile POS systems, credit card terminals have one main function: to process payments. Terminals do come in a variety of styles and setups—some work best for payment systems at fixed business locations while others are built with mobility in mind. If you’d rather have something simple without too many bells and whistles, a credit card terminal may be a better fit for you. But if you’re interested in having extra features and programs for running your business efficiently—all in one place, mind you—start looking into POS systems. No matter what you choose, you should consider purchasing a device that accommodates Europay, MasterCard, and Visa (EMV) rather than just a basic card reader. An EMV chip card has an embedded microchip that deters fraud more effectively than its magstripe counterpart. The chip makes it difficult for thieves to steal usable card information, putting a stop to potential card fraud. With all of the different POS systems on the market, from basic setups to more advanced systems with a variety of tools and features, you might be focused on features and tech specs. But don’t forget to do your research when it comes to cost. For instance, some vendors charge a flat percentage for all credit card transactions with no fees for additional transactions. If you don’t want to pay large up-front fees, other vendors offer lower monthly subscription rates and lease options. As a new business owner, you can also try free 30-day trial periods to help you decide if a POS system will work well for your business. I use livepos in my retail store and it works great for me. The features are very useful, it makes our work easy in our everyday transactions. We use livepos in our store and it works great for me. Every feature is helpful in our every operation. Livepos is the best pos for me. I’ve been using it for a couple of years now. It helped a lot in making my business successful. I’ve been using livepos in my multi-stores and it makes our work easy. Their features are amazing. I use livepos in my business for a couple of years now. It’s a great pos system for my stores. Everything is working great, the features are very helpful in every transaction. HDPOS simplifies the accounting process and it make easy to look up past transactions . A POS software is very helpful for small business. For a couple of years using livepos my business has been very successful. A very easy to use and reliable system. Livepos is the pos I’ve been using in my multiple location shoe stores. It has all the features I need to run my business smoothly. A pos system is a great help in every business nowadays. I own a multi-stores and I choose to use livepos. They have all the features that I need to run my business smoothly. Out of so many pos systems, livepos is the one I trust to use in my multiple location store. They have all the features I need to run my business properly and make it grow in a short period of time. Livepos is really great, this help my business to grow easily. Their features are the best, very helpful and reliable. Using livepos in my stores, everything is easily done. Inventory, sales report, transactions, etc. This is very helpful and reliable software for me. I use livepos in my stores and it really works great for me. Every feature of livepos is special and very reliable. Livepos features are the best, it works great in my stores. Everything is running smoothly, the system is the best help I had for a couple of years now. I choose to use LivePOS because their features are compatible in my multiple stores. This has been a great help for a couple of years now. The features of livepos are the reasons I use them in my stores. It’s a great help in running my business smoothly every day. We’ve been using livepos software for years now. It’s great because it is a hybrid cloud-based pos, a very helpful in running my retail stores. One of the things I consider in finding a pos, it must be easy to use with great features. I find it with livepos, their software is easy to learn how to use and it really saves so much of our time. The pos we use helps a lot in collecting our customers’ data so that we’re able to promote our stores to them. LivePOS is very helpful in running my business and making it successful. Livepos is our pos for more than a year now and this has been the best solution for my business. Everything is easier with their cloud-based pos. I am lucky that through searching a pos for my stores I found the right one and it’s livepos. This software has all I need to handle my business smoothly and lets me monitor everything in my stores anytime, anywhere. My sales improve a lot since we use livepos. Our work has been easier with this software, it really helps a lot for us. I’ve been running my multi-store for a couple of years now and we use livepos in our daily operations. This helps a lot in tracking sales and inventory in real-time. I can control and view everything in my shop with the help of the livepos online dashboard and real-time inventory management. This also helps in securing our files, very helpful pos software. I love livepos because I can access in real-time the online dashboard to see what is going on in my business no matter where I am. The pos system I use in my store for a couple of years now is livepos. They provide great features that really help in running my business smoothly every day. LivePOS is one of the best pos out there. Tracking my stores anytime and anywhere I am is one of the problems that livepos solved for me. ultimately, increase sales, then an EPOS system could be the missing piece to the puzzle. EBMBOOK POS is the most best They provide great features that really help in running my business smoothly every day. I consider in finding a pos, it must be easy to use with great features. I find it with EBMBOOK, their software is easy to learn how to use and it really saves so much of our time.